I am happy to be able to announce that I have won my heat of the BBC New Comedy Award 2014. The heat actually took place during the Edinburgh Fringe Festival in August, but it has just recently been aired on the radio. 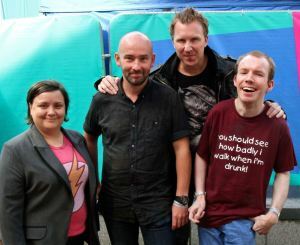 One of the judges on the day was Jason Byrne and I was one of ten comedians in the heat. It was all very exciting as I didn’t expect to win it at all. I would just like to thank everyone who came to watch it on the day for being lovely and making it a pleasure to play. Of course, I’d also like to thank those of you who couldn’t make it for your continued support as well. It means a lot. I would also like to take this opportunity to thank everyone who made my Edinburgh Fringe Festival so wonderful. Cheers if you came to see my show. It was such a pleasure to work with such brilliant people at The Stand and the Assembly Rooms and to meet so many great people during my stay in Edinburgh. Highlights of my time in Edinburgh this August were obviously winning my heat of the comedy award and having to stand in for Martin Mor when he suddenly got ill. It was also an absolute joy to play Lili La Scala’s Another F*cking Variety Show and to catch up with so many old friends. It was a very mental but very enjoyable month….and I didn’t even go near a hospital either! Anyway, back to the BBC New Comedy Award, the semi final takes place in November with the final being in December. Wish me luck! If you missed the heat on the radio, you can listen again below….